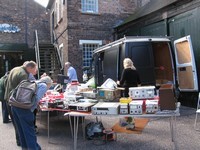 Last year a new exhibitor said afterwards. . . ."Many thanks to you and everyone for a brilliant Telford Hamfest/GQRP rally." and a visitor said "My first attendance at a radio event in many years, and it was a lovely weekend!" Saturday 31st August 2019: G-QRP social and Buildathon at Telford. For the first time, this will take place at the same venue as the Telford HamFest - Harper Adams University. Telford & District A.R.S. are delighted that the 14th Telford Hamfest takes place this year in September, co-ordinated with the G-QRP Convention and Buildathon. We are indebted to the staff at HAU for making this outstanding venue available..
A list of Exhibitors from 2018 can be found on the left hand Navigation Menu. As Bookings are made, this will be updated for the current year. 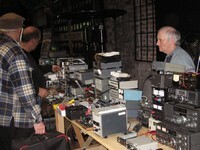 The HamFest opening time will be 10:15. The Special Features page is also worth checking out. . There will be something there for everyone, with an emphasis on QRP operation and construction in the presentations. The usual Flea Market will be right outside the new exhibition Hall. 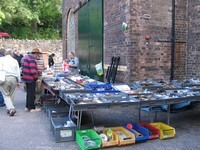 More sellers took advantage of this facility last year. Tables are available at just £10 each on a first-come-first served basis. An advance phone call to Martyn on 01952 255416 would be very helpful in planning space. The Committee and club at TDARS are working hard in preparation for the 2019 event at its new site.The venue offers more than just a traditional radio rally and we have developed a good reputation both from our exhibitors and visitors for careful preparation and organisation on the day. The venue is just a short distance (10 miles) north of the M54 (J3) and is easily accessed from other trunk roads: SatNav code TF10 8NB. See location tab for more detailed directions. From feedback and given our experience over the years, most available space will be booked prior to the event. We anticipate that a good day will be had by all. You are welcome to respond on Twitter (@g3zme) or Facebook (telfordhams).